Restless Chipotle » Why Is Certified Angus Beef Brand® Better? Why Is Certified Angus Beef Brand® Better? 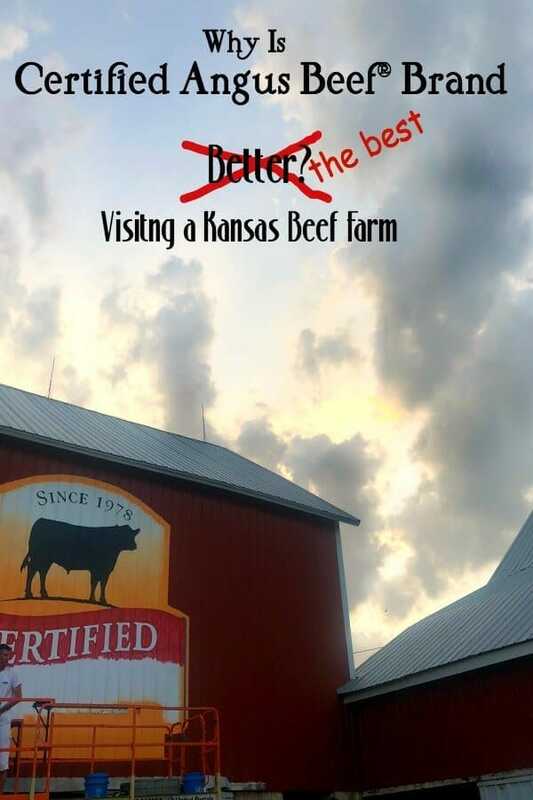 Recently Certified Angus Beef® Brand and Sunday Supper, LLC invited me to experience life on a Kansas beef farm with a few other bloggers so that we could see exactly what makes angus beef better. Day two we toured the farm, the feed lot, and helped to celebrate their 40th anniversary with a big barn branding party. Day Two was the busy day. We left the hotel at 7 am to head for Debbie Lyons-Blythe’s (Kids, Cows, and Grass) family farm about 2 1/2 hours away. A 2 1/2 hour drive is nothing in Texas – sometimes it takes that long to get from one side of Dallas to another. It was a great time to just talk to the other bloggers and get to know them a little better. 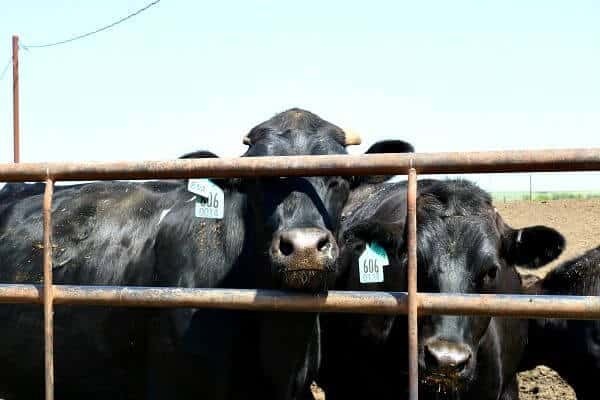 When we got to the farm we had a few minutes to chat, admire the gorgeous Victorian farmhouse, and stretch our legs then it was back into the car for a tour of Tiffany Cattle Company, the feedlot. When I was growing up one of my uncles had a beef farm and another had a dairy farm. I am no stranger to acreage, cattle, and feedlots but it’s been decades since I’ve visited. Tiffany Cattle Company is located on the site of a World War II Army Air Corps base – which was interesting for another reason. You see, I knew that my dad had gone for training on an Army Air Corps base in Kansas – but I didn’t know which one exactly. I knew it was in Morris County – which, oddly enough, is my maiden name. Well, Morris – not Morris County. You guessed it. That was the exact same spot Dad had taken off and landed during his training. I literally got chills and it gave me a feeling of closeness to him that was comforting. He and I were especially close – he passed in 2001. So then we took a tour around the feedlot with Shawn and Shane Tiffany. It was really fascinating how much science goes into creating your steak dinner. For example, the cattle are given a little capsicum (hot pepper) with their feed because it helps them to stay cool and comfortable in the heat. Their diets are strictly watched and managed to keep them healthy and happy. The cattle eat on schedule every day and they each have their own place at the trough.Apparently they are pretty OCD about where they eat – in fact I saw a little scuffle where one cow kicked another out of a spot. Presumably someone took someone else’s place at the table. Each farms’ herd is in its own paddock so that the cattle aren’t mixed. There’s plenty of area in each paddock to allow the cows to be cows but usually we saw them all, heads together, gossiping at the fence line with all that open space behind them. Cows aren’t much different than people, I guess. Each one of the cows is identified by a number and each has a paper trail of when it got there, any problems it has had, and other details to ensure nothing gets by unrecorded. Cowboys ride the paddocks daily to look for injured or sick cows and make sure everything is the way it should be. I was going to try to explain how antibiotics were used, when, and why but I decided to let Debbie speak for herself because her explanation of antibiotic use in cattle is much more detailed than mine ever would be. One thing Shane said that I thought was fascinating was that God enabled cows to take inferior proteins (grass) and turn them into food we can eat. I’d never thought of it in that way. Looking out over that Kansas prairie you might think that you could grow a hell of a lot of vegetables and feed more people but you’d be wrong. The underlying area is good for growing one thing well – grass. But What Makes Certified Angus Beef® Brand Better? I did ask this question in a roundabout way and the answer didn’t surprise me. First of all angus beef is well known for the fine marbling in the meat – the fat is dispersed evenly and generously. This typically creates a more tender, juicier, and delicious meat than other breeds. But that’s not all. Certified Angus Beef® Brand has high standards to ensure that your steak dinner is the best possible. I learned that the paddocks that had too many other breeds mixed in with the angus beef wouldn’t make it as Certified Angus Beef® Brand. When the cattle go to be processed they are examined carefully and then after processing it is examined again for marbling and quality. 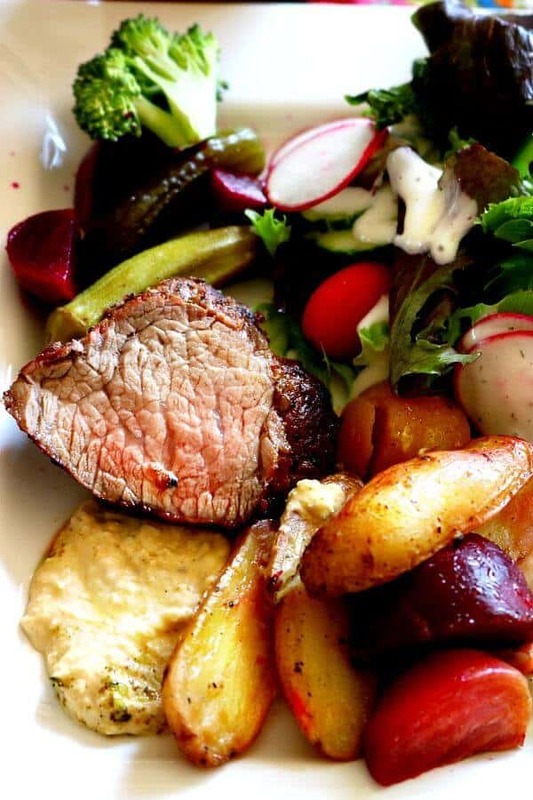 All of that ensures that their beef is consistently delicious and tender. That’s what makes angus beef better and Certified Angus Beef® Brand the best! Back at the farm we had a delicious lunch with a salad that I HAVE TO get the recipe for. We cooled off and rested a bit then headed out to check out Debbie’s cows and pastures. She is so passionate about her work that it is obvious in everything she says, in her body language, and in her property. I don’t think you could separate her from the farm if you tried. She’s as much a part of it as it is a part of her. 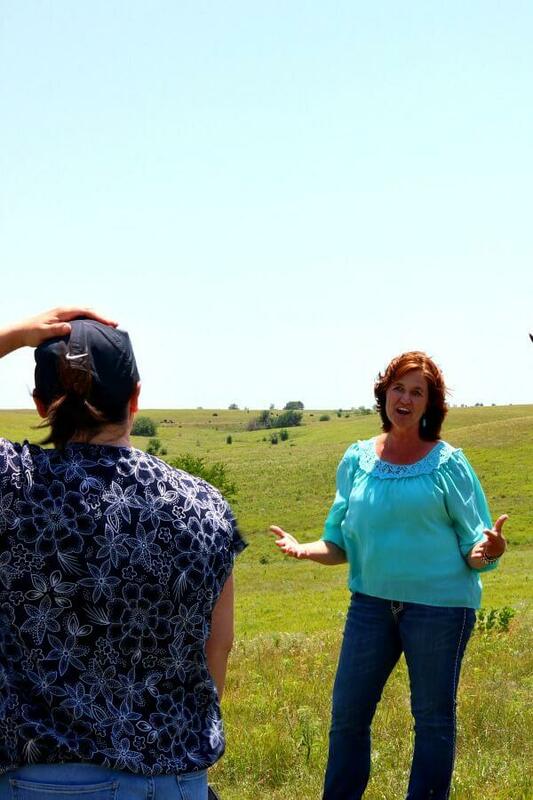 She explained how she could look at the various plants growing in the pasture and see whether it was healthy or not. Yearly they burn off pastures to allow new grass to grow back and to keep the weed population down – especially thistle. While she was talking I watched as some of the cows sauntered into a stock tank (they call them ponds up there – in Texas they’re called tanks) to have a little swim and cool off. It’s relaxing and comforting to watch those cows act like…cows. We saw a solar powered well that they used to water the cattle as well. 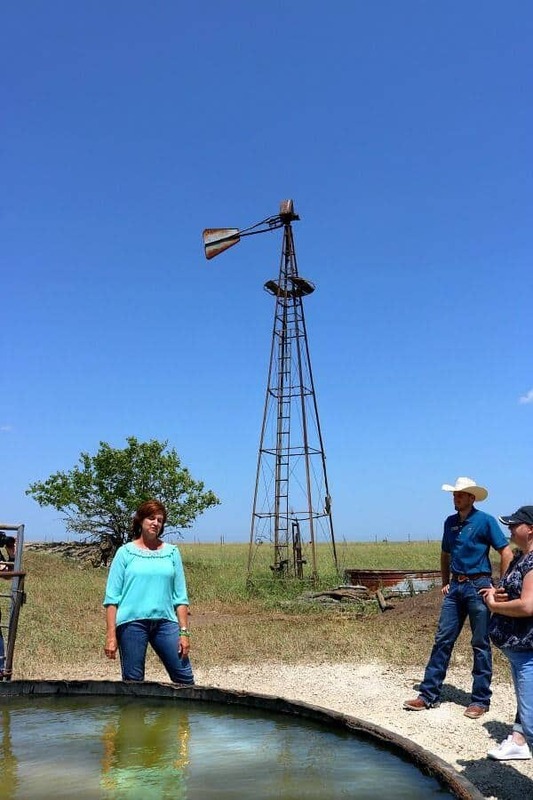 The solar powered wells are replacing the old-time windmills across the countryside. As long as the ground water levels hold up there will be fresh, cold water for the cattle. Right now Kansas is in serious drought and there’s concern about the ground water levels as well as the health of the various crops. Pray for rain, y’all. If you are a banker or work in retail or a blogger then rain is either a nuisance or soothing to watch. If you’re a farmer rain is imperative to your livelihood – lack of it is devastating. Kansas is currently pretty devastated. After that we returned to the farm and headed to the barn to watch Troy of Free Sky Studios work on the barn. 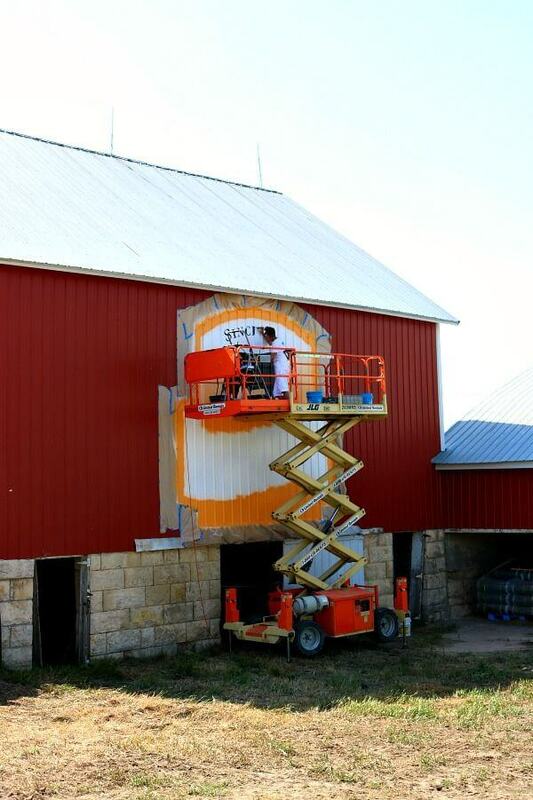 You see, it’s Certified Angus Beef ® brand’s 40th anniversary so they are painting 40 barns across the country with their logo. The Blythes’ barn is number 16. We also took part in a celebration that included plenty of delicious food, ice cold beer, and wine. Afterwards we sat in lawn chairs and watching Troy continue to paint the barn – there’s nothing as relaxing as watching grass grow and paint dry, y’all! I also watched some gorgeous thunderheads building up in the sky and hoped it meant at least a little rain. It did but not enough to really turn things around. It was a fabulous trip and I just want to thank Certified Angus Beef® Brand, Debbie Lyons-Blythe, and Sunday Supper, LLC for a much needed break from work, wonderful hospitality, and a great learning experience. After spending the day there I really understood why Certified Angus Beef® Brand beef was exceptionally tender and delicious. There’s a whole lot of care, hard work, and attention to minute details that goes into it. In the next post I’m sharing one of my favorite, childhood recipes. There’s a lot of ways to eat beef but this happens to be my favorite, y’all! Kansas City BBQ A BBQ restaurant in Kansas City that serves up Certified Angus Beef ®Brand for all of you who like good BBQ. (Spoiler alert- I still like Texas BBQ better). Old Fashioned Beef and Noodles – It just doesn’t get better than this easy, old fashioned recipe you make in a slow cooker! Thanks Marye for all the behind the scenes information. It’s important to know all about your food since every part factors into making Certified Angus Beef® Brand the best Angus beef!